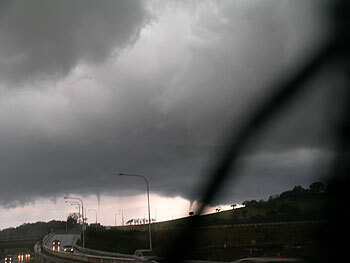 5th September 2004 - Waterspouts off Illawarra coast. A rather strange two days of chasing. On the 4th of September a cold pool of air in the middle to upper atmosphere approached the Illawarra from the west. Until the afternoon weak cumulus filled the sky, but struggled to organise into even a light shower. By mid afternoon some small storms developed near Nowra, these gave isolated heavy falls of small hail causing traffic chaos. 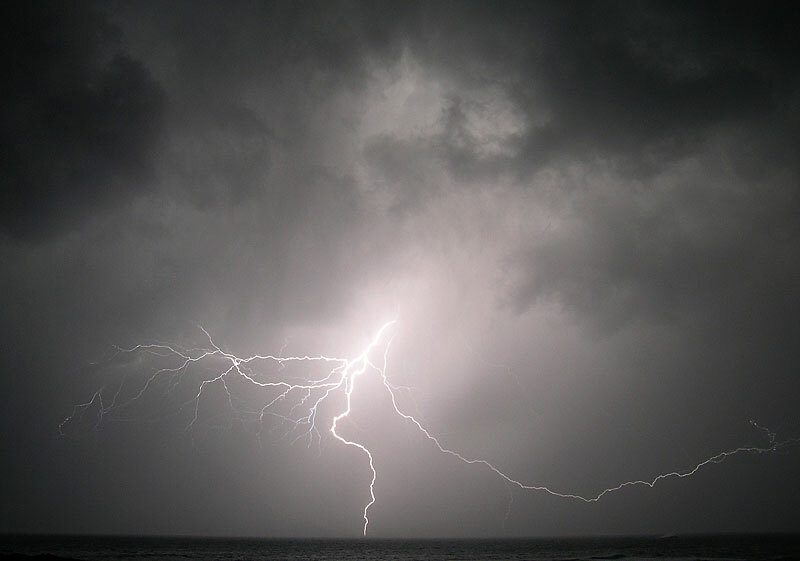 Later in the evening a nice lightning show developed offshore. The 5th was looking quite good with the cold pool due more or less overhead. The morning dawned sunny and rather mild. Offshore about 50kms to the NE was an active storm. Unusual was that the anvil was pointed S/SE, and the base was drifting very slowly SW towards the coast. Although not unknown, storms drifting in from the ocean on this coast are uncommon, especially stand alone storms, rather than embedded storms. The base was very persistent, and although weakening somewhat was still recognisable as a distinct unit some hours later. As the day wore on weak convection over the land took off and hitting the cold air in the middle layers it was not long before weak glaciation and rain filled the western sky. But this mess was not drifting seaward ( as would be usual ). However the outflow boundaries did move east and when interacting with the weak offshore cells slightly more vigorous storms developed right on the coastal plain. I was waiting for something more organised to chase when I received a call from Steve a fellow Illawarra chaser, he informed me that the Wollongong lighthouse area was white with small hail. We met up at the lighthouse and indeed it was white with small hail. We decided to pursue the storm SW, again an unusual direction to tag a storm. Two funnels are sighted offshore Kiama, we are about 3kms inland. We drove through some heavy rain and small hail accompanied by a moderate rate of CG's. Near Albion Park Rail we finally broke out of the rain / hail and saw two funnel clouds ( see photo ). 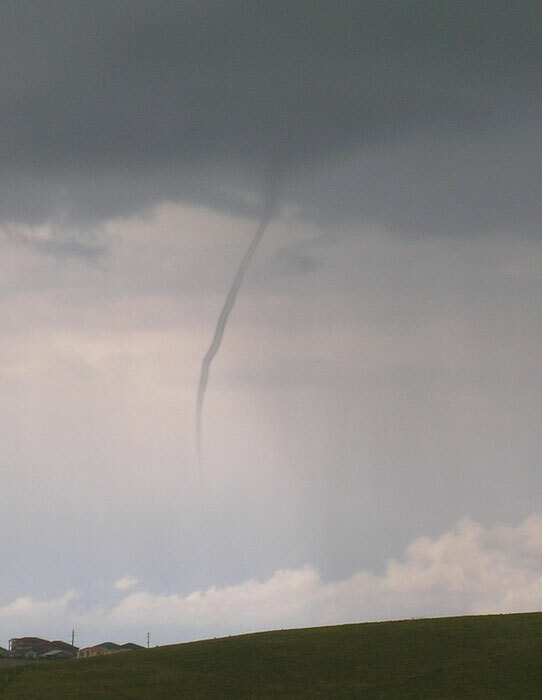 I knew immediately that these would be over the ocean and that they may become waterspouts. Although only 3 kilometres ( 2 miles ) inland I was still at 10 mins from an ocean vantage point. It is times like these that everybody else on the road seems to crawling. Rather than trying stupid road stunts in an attempt to get to the seashore we finally pulled off the highway and took some photos from Dunmore, about 1.5kms ( 1 mile ) inland. 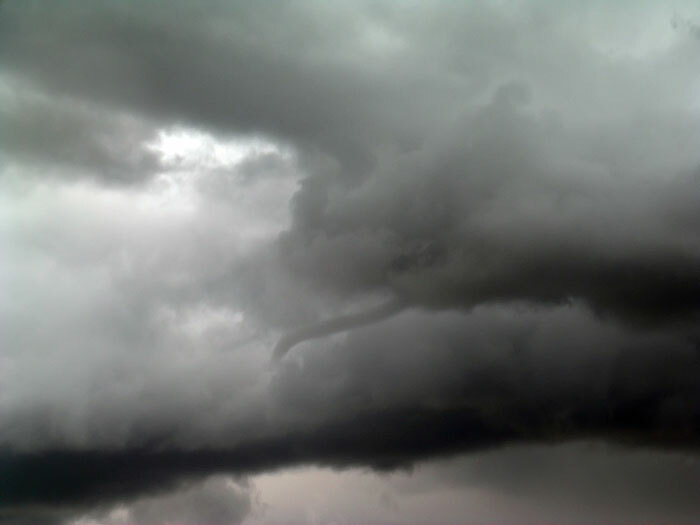 At this time the funnel on the left became rather long and thin - this funnel was filmed by a local Kiama resident on the water. 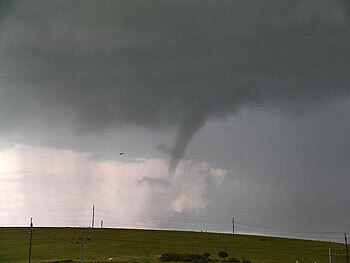 The left funnel died shortly afterwards, but the funnel on the right grow wider. The photo at the top of page shows this funnel. Cold outflow from the storm just inland then undercut the base that the funnels had formed from and they died completely. This is the same funnel as the one on the left in the photo above. This was filmed on the water by a resident of Kiama, and shown on the TV news. Another small funnel develops just south of Kiama Blowhole, but dies soon after. We were now overtaken by rain too, so we drove further south to Kiama Blowhole. 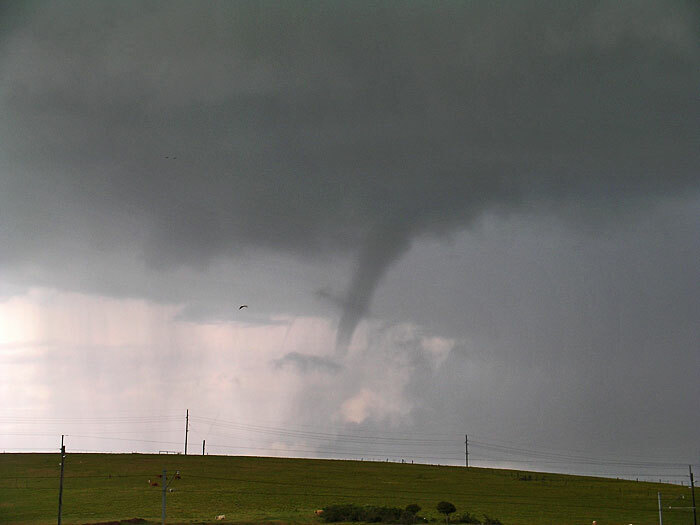 Here we observed yet another weak funnel. I pursued the storm further southwards to Gerringong, where I observed three more very brief funnels ( no pictures sorry ). 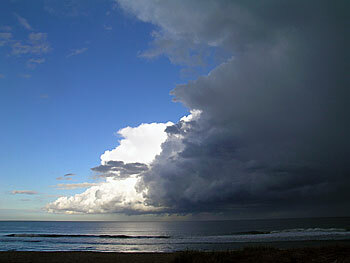 The storm continued further south to Nowra, then onwards to Jervis Bay. At several stages in the pursuit I ran into areas of small hail. At Jervis Bay there was an area were drifts up to 10cms ( 6 ins ) lay and hail fog lay close to the ground. Here finally after 4 to 5 hours the activity died. It was not one contiguous storm, but rather a series of smaller cells propagating S/SW, each feeding off outflow boundaries of previous activity. The rear of the complex as it drifts S/SW towards Jervis Bay. I was standing in a ground cover of small hail when I took this photo. 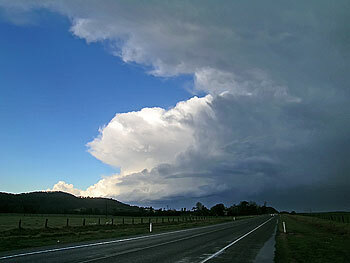 Looking east from Nowra.